Argon-Argon Dating: What is it good for? Most people envision radiometric dating by analogy to sand grains in an hourglass: the grains fall at a known rate, so that the ratio of grains between top and bottom is always proportional to the time elapsed. In principle, the potassium-argon (K-Ar) decay system is no different. Of the naturally occurring isotopes of potassium, 40K is radioactive and decays into 40Ar at a precisely known rate, so that the ratio of 40K to 40Ar in minerals is always proportional to the time elapsed since the mineral formed [Note: 40K is a potassium atom with an atomic mass of 40 units; 40Ar is an argon atom with an atomic mass of 40 units]. This relationship is useful to geochronologists, because quite a few minerals in the Earth’s crust contain measurable quantities of potassium (e.g. mica, feldspar, and volcanic glass). In theory, therefore, we can estimate the age of the mineral simply by measuring the relative abundances of each isotope. Over the past 60 years, potassium-argon dating has been extremely successful, particularly in dating the ocean floor and volcanic eruptions. K-Ar ages increase away from spreading ridges, just as we might expect, and recent volcanic eruptions yield very young dates, while older volcanic rocks yield very old dates. Though we know that K-Ar dating works and is generally quite accurate, however, the method does have several limitations. First of all, the dating technique assumes that upon cooling, potassium-bearing minerals contain a very tiny amount of argon (an amount equal to that in the atmosphere). While this assumption holds true in the vast majority of cases, excess argon can occasionally be trapped in the mineral when it crystallizes, causing the K-Ar model age to be a few hundred thousand to a few million years older than the actual cooling age. Secondly, K-Ar dating assumes that very little or no argon or potassium was lost from the mineral since it formed. But given that argon is a noble gas (i.e. it does not bond to any other elements), it can readily escape from minerals if they are exposed to significant amounts of heat for a prolonged period of time. Finally—and perhaps most importantly—the K-Ar dating method assumes that we can accurately measure the ratio between 40K and 40Ar. I emphasize this assumption, because it is so commonly overlooked by those unfamiliar with radiometric dating! We often take it for granted that measuring chemical concentrations should be an easy task, when it is not. Measuring the ratio between 40K and 40Ar is especially difficult, because potassium is present in minerals as a solid, while argon is present as a gas. Although this detail may sound minor, it implies that we cannot measure 40K and 40Ar simultaneously on the same instrument. Why is this a problem? Imagine that you were tasked with measuring the ratio of your weight versus that of a newborn baby. Ideally, you would use the same scale in one session by taking two measurements: one of you standing on the scale by yourself, and one of you holding the baby. In this case, it wouldn’t matter if the scale were slightly inaccurate (and most scales are), because both measurements will be off by the same amount, and you only need the ratio of weights. Potassium-argon dating, however, is akin to weighing yourself on a bathroom scale at home, while weighing the baby on the vegetable scale at the local grocery store—each instrument has its own calibration and uncertainty. Your final answers may be similar, but there is far more room for error when having to use separate tools and analyses. When it comes to analyzing the abundance of individual isotopes, mass spectrometers are far better at measuring ratios than absolute concentrations. They are very good, for example, at measuring the ratio of 13C to 12C, or 18O to 16O, or even 40Ar to 39Ar, because in each case, both isotopes are in the same chemical form. This fact allows them to be measured and compared simultaneously on the same instrument. So how did researchers overcome this challenge for the K-Ar method? Quite simply, they devised a way to turn potassium into argon! Using a nuclear reactor, the mineral sample is bombarded with neutrons, which interact with a particular isotope of potassium (39K), essentially by knocking a single proton out of the nucleus and replacing it with a neutron. This process causes the atom to ‘move down a notch’ on the periodic table (from K to Ar) while retaining the same mass. After converting all 39K to 39Ar, geochronologists can effectively measure the isotopic ratio between potassium and argon simultaneously on the same instrument. This seemingly minor difference resulted in Ar-Ar dating being a much higher precision alternative to K-Ar dating by effectively removing the third assumption. What about the other two assumptions behind the K-Ar method? Fortunately, the Ar-Ar method can address both by 1) building an isochron and 2) using a step-heating method during analysis. 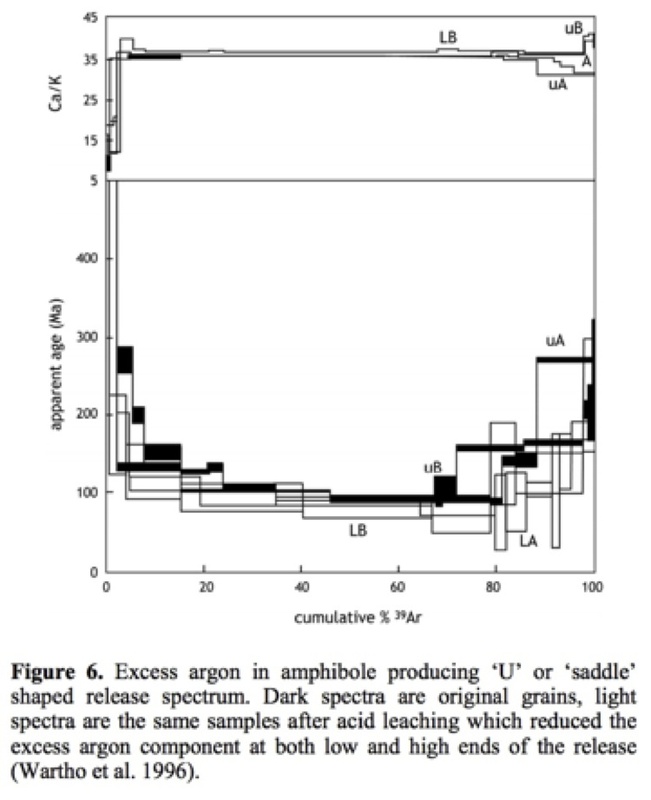 Isochron methods work by measuring a third, stable isotope in addition to the pair that gauges radioactive decay (in this case, 36Ar alongside 39Ar and 40Ar). Having this third isotope allows us to measure directly (and not simply assume) how much argon was in the mineral at the moment that it crystallized. By way of analogy, imagine that you were to stumble onto a foot race already in progress. Could you find the position of the starting line if it were not marked? Well, if you knew each runner’s speed and location, you could simply extrapolate back in time to the point when all runners were at the same position. In an Ar-Ar isochron, geochronologists essentially measure all three isotopes in different parts of the same mineral and then plot the points (Fig. 1). The resulting best-fit line indicates the amount of initial argon. If that amount is significantly higher than the atmospheric ratio of 295.5, then we know that the mineral contained excess argon when it crystallized and likely will not yield a reliable date. Otherwise, the reliability of the age is confirmed and we don’t need to make the first assumption. Figure 1: From Brumm et al. (2010), an optimal Ar-Ar isochron that confirms the date is reliable. Note that the best-fit line intercepts the Y-axis at 0.0034, which is equivalent to a 40Ar/36Ar ratio of 297±4. Since this value is within uncertainty of the atmospheric ratio (295.5), we know that the mineral did not contain excess argon when it formed. As mentioned, argon is a noble gas, which does not form chemical bonds with the mineral itself. In this sense, argon is much like dust particles trapped inside of a rug. So long as the rug is held still, its fibers will hold the dust in place, but when energy is added (e.g. by shaking or beating the rug), the dust is released from the grip of the fibers. To measure argon isotopes in a mineral, therefore, we simply add energy to the mineral in the form of heat. This heat exhibits itself as vibrational energy at the molecular level, which causes the argon to be loosed from the mineral structure, so that it can be analyzed as a free gas. Geochronologists are quite clever, though, in that they heat the mineral in steps. A little heat is added, so that ~5-10% of the argon is released and measured, much like tapping gently on your dusty rug. Then the temperature is raised so that an additional ~10% of the argon is released and measured—now a firm pat. Little by little, the temperature is raised until all of the argon has been released from the mineral, and a radiometric age is obtained for each of the 10+ steps. But why do this? Stepwise heating allows geochronologists to determine how evenly the isotopes of argon are distributed throughout the mineral. If each step yields the same radiometric date, then the isotopes were perfectly and homogenously distributed. Not only would this result in a very precise age of the mineral, it would also demonstrate that the mineral never underwent significant argon loss—the second assumption that limits the accuracy of K-Ar dating. Imagine that before you performed a ‘stepwise beating’ of your dusty rug, a gentle wind had blown against it, causing all of the loosely attached dust to fall off prior to analysis. As a result, gently tapping the rug would not yield any dust. Similarly, if a mineral were exposed to natural heat sources at some point in its history, the energy would cause all loosely attached argon to escape from the mineral. Consequently, the first step of Ar-Ar analysis would yield an age that was too young, because it would appear as though very little argon had been produced by radioactive decay. On the other hand, imagine that your rug contained pockets of concentrated dust. In this case, an excess amount of dust would suddenly be released during the ‘stepwise beating’ process. Similarly, minerals often contain tiny inclusions of other minerals within their structure (too small to be noticed without high-powered microscopes). Most inclusions will contain far more argon than the surrounding mineral, meaning that during stepwise heating, that argon will suddenly be released. This results in anomalously old ages for some of the steps, as in the figure to the right. Geochronologists can thus use patterns in stepwise heating analysis to demonstrate if the resulting mineral age is reliable. Along with added precision during measurement and the potential utilization of isochrons, the Ar-Ar has become a golden standard in determining the age of rocks. Unlike conventional K-Ar dating, which is generally accurate but relies on several assumptions, the Ar-Ar method is both extremely precise and allows for detailed analysis of the mineral’s history. As an example, consider the Cardenas Basalt—a well known ancient lava flow near the base of the Grand Canyon. Thirty years ago, geochronologists used the Rb-Sr isochron method to constrain the age of this lava flow to 1070 ± 70 million years old (Elston and McKee, 1982). 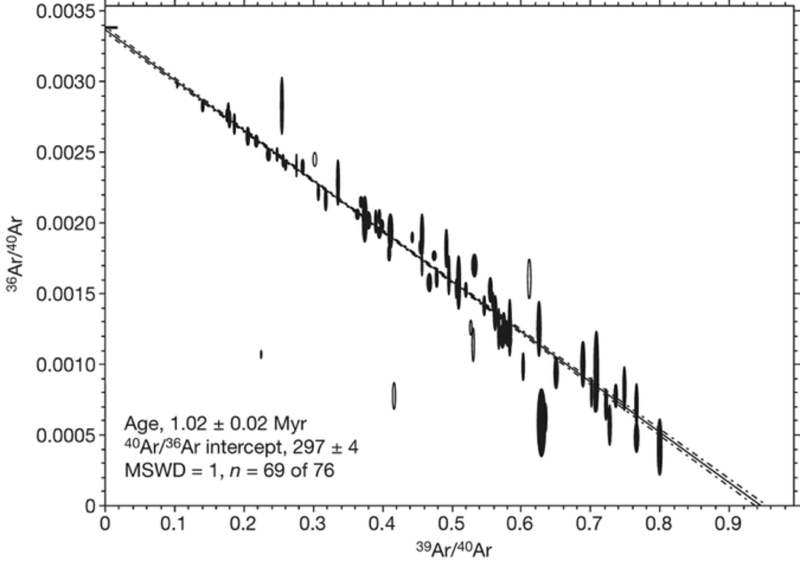 Twelve years later, additional Rb-Sr data were incorporated into the existing isochron to yield a slightly more precise age of 1103 ± 66 million years old (Larson et al., 1994). Ten years ago, however, researchers used the Ar-Ar method to date a specimen of biotite mica within the lava flow (Timmons et al., 2005). 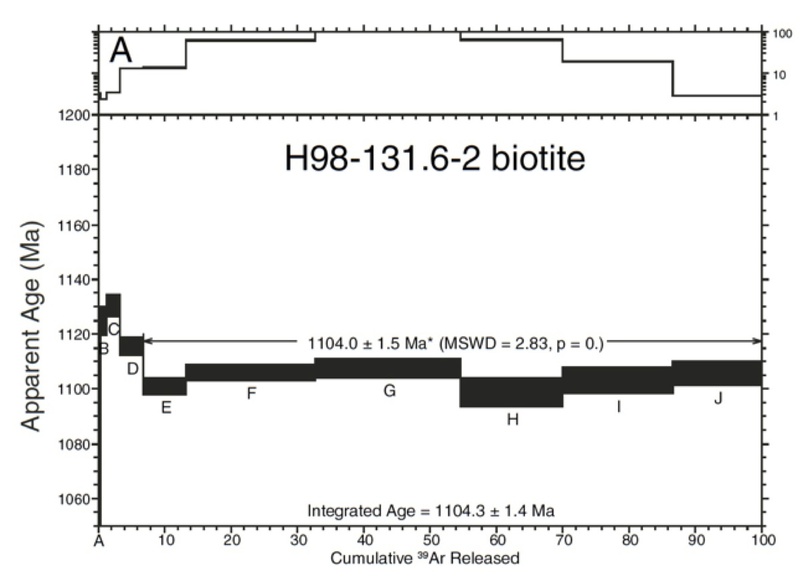 Since the stepwise heating analysis demonstrated a homogenous distribution of argon isotopes and no excess argon when the mineral formed, the resulting age (Figure 2, below) was both extremely precise and consistent with previous estimates: 1104.3 ± 1.4 million years old. Figure 2: Biotite sample from Timmons et al. (2005), showing Ar-Ar ages for each heating step. Note that ages are essentially the same at each step, except for the initial heating (5% of argon released). During those first couple steps, traces of excess, loosely bound Ar (likely atmospheric contamination) caused the age to appear ~20–40 million years too old. Brumm, A., Jensen, G.M., van den Bergh, G.D., Morwood, M.J., Kurniawan, I., Aziz, F., and Storey, M., 2010, Hominins on Flores, Indonesia, by one million years ago, Nature, v. 464, p. 748–752. Elston, D.P., and McKee, E.H., 1982, Age and correlation of the late Proterozoic Grand Canyon disturbance, northern Arizona: Geological Society of America Bulletin, v. 93, p. 681-699. Larson, E.E., Patterson, P.E., Mutschler, F.E., 1994, Lithology, chemistry, age, and origin of the Proterozoic Cardenas Basalt, Grand Canyon, Arizona: Precambrian Research, v. 65, p. 255–276. Timmons, J.M., Karlstrom, K.E., Heizler, M.T., Bowring, S.A., Gehrels, G.E., Crossey, L.J., 2005, Tectonic inferences from the ca. 1255–1100 Ma Unkar Group and Nankoweap Formation, Grand Canyon: Intracratonic deformation and basin formation during protracted Grenville orogenesis: Geological Society of America Bulletin: v. 117, p. 1573-1595. “Aha – ICR YEC catches scientists indoctrinating with myths! Yet all the ICR want to talk about is ‘dubious assumptions’. Appearance of age or true age? Better yet—what's the difference? My aim is to provide an online resource for Earth science education, particularly for the community of faith. More people than ever are leaving the church due to perceived conflicts between science and faith, yet creation-science ministries continue to claim that geological evidence supports a young Earth (less than 10,000 years). I examine those claims critically and provide a disciplinary context in which to evaluate the merits of young-Earth creationism.